Submit an article about your product to 500+ Article Directories! We submit your article to 500 on-line article directories. How is this different from what our competitors offer? We create personalized author accounts for you on each site while others submit your article only under their own account. We handle all the "dirty" manual operations: CAPTCHA image processing, mail processing, confirmation link processing, password management and more. We provide you with comprehensive submission reports. You get a list of all the article directories where you can see the sites that have actually published your article. 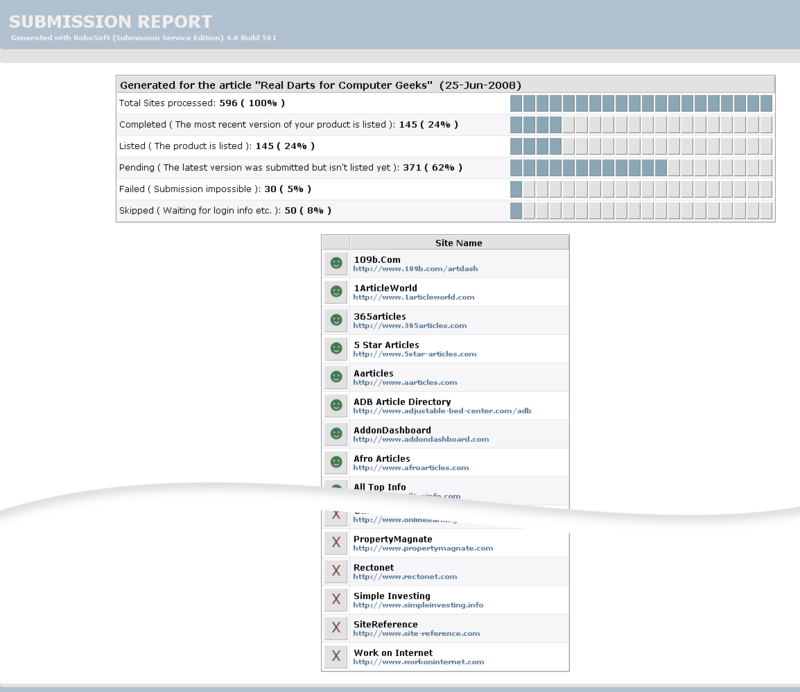 Click here to see a sample submission report. We select the appropriate article format according to each site's posting rules. Your article will contain HTML formatting where it is allowed and will be in plain text where needed. We fill out any forms which require your information such as author biographies thus creating more links to your site. The database of article directories is updated on a daily basis. There will be no dead links, no broken scripts. The main reason to submit an article about your product is to improve your site's position on the SERPs by specific key phrases. Additionally, we can bookmark your article in 50+ popular social networks. If it's innovative, provocative and is interesting to the wide public, it will be read and can become popular in the social networks.